﻿ Naama Inn Hotel Sharm El Sheikh. JIMAT di Agoda.com! Menawarkan penginapan yang berkualiti tinggi di daerah pantai, aktiviti malam di Sharm El Sheikh, Naama Inn Hotel merupakan pilihan popular untuk kedua-dua tujuan perniagaan dan percutian. Dari sini, tetamu boleh menikmati akses mudah kepada semua yang bandar meriah ini boleh tawarkan. Juga terletak berdekatan adalah Kelab Selaman Camel, Mena Tours, Pusat Perubatan Sharm. Naama Inn Hotel menawarkan perkhidmatan yang sempurna dan semua kemudahan penting untuk menceriakan pelancong. Tetamu hotel boleh menikmati kemudahan seperti meja penyambut tetamu 24-jam, daftar masuk/daftar keluar ekspres, layanan bilik, bilik keluarga, restoran. Alami bilik dengan kemudahan berkualiti tinggi sepanjang anda menginap di sini. Sebahagian bilik menyediakan akses internet (wayarles), kolam renang peribadi, internet tanpa wayar (percuma), pendingin hawa, meja untuk memudahkan tetamu berehat dan kembali bertenaga. Di samping itu, pihak hotel menawarkan aktiviti rekreasi untuk memastikan anda mempunyai perkara untuk dilakukan sepanjang penginapan anda. Temui gabungan yang menarik antara perkhidmatan profesional dan pelbagai kemudahan yang ada di Naama Inn Hotel. Ziad mohamad is so kind if you need some help please tell him he will tell you everything! Pretty clean, comfy beds, good AC, nice pool, great beach, close enough to airport, decent breakfast. For what we were looking for, Naama Inn was perfect. We knew we'd be gone for most of the day each day diving, so we just wanted a comfortable place to retire at the end of each day. The room we got at Naama Inn was spacious, with a tiny, private balcony and a large shared terrace out front. Breakfast was ok (not awesome), but just fine for our needs. The staff was super helpful and kind. We were only a 5 minute walk from Camel Dive Shop and about a 7 minute walk from the beach. Additionally, there was a fairly conveniently placed Carrefour about 5 minutes up the road. 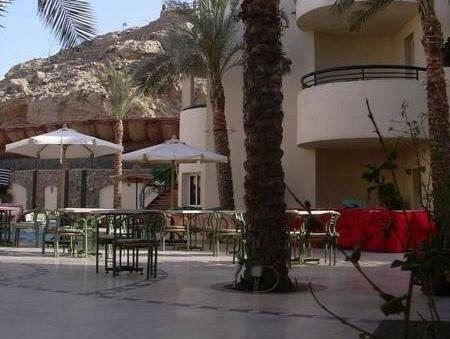 We're planning on returning to Sharm again in the future and when we do, we'll stay at Naama Inn. Found this last minute and arrived late at night. Staff were friendly and helpful. Gave us a choice of rooms and ours was spacious and clean. Comfy beds with good Aircon. Breakfast was a buffet, lots of pastries, cornflakes, and some cooked breakfast. Not the best food, but lots of it. Our big problem was the awful WiFi. We couldn't get it in or even near our room. We had to go to reception to use it and even there it went off every 5 minutes. I feel a big hotel should have better WiFi than this! Didn't get a check to use the pool, but it looked nice. We got beach towels and a pass to use a section of beach, although not told where and no one at the beach seemed to know. Eventually found it and it wasn't a great piece of beach. Staff let us store bags after check out and stay in the lobby which was really nice, so very grateful to them.